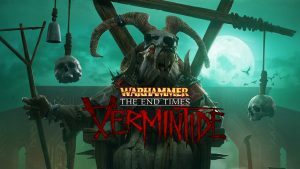 Warhammer: End Times – Vermintide is a co-operative first-person action game that takes place in the Warhammer universe. It has a style of gameplay you could easily compare to Left 4 Dead, but with a focus on first-person melee combat and taking place in Warhammer’s thick lore. The game was made available on PC initially, soon being brought over to PS4 and Xbox One. Revealed via a live stream on Twitch, the developers Fatshark put a team together back in Spring tasked with bringing Vermintide into virtual reality and it’ll be coming out before the year ends. The team working on this is building levels up for the VR version and adding weapons as they make sense. During the stream, they showed a few levels and only two weapons: a magic skull staff and bow & arrow. They also gave away a few computer rigs as fans tuned into the gameplay stream. Your setting in Vermintide is the town of Ubersreik, a shipping town mostly inhabited by Dwarves and Humans. The town is overrun by Skaven, a savage group of rat-like humanoids that inhabits sewers that extend to many areas. Their unnatural metabolism gives them a skittish nature that lends to heightened agility and speed which makes them the perfect foes for a high-energy first-person shooter and melee experience such as Vermintide. Games Workshop has taken the Warhammer franchise and kicked it into high gear the last couple of years. The world presents so many interesting settings, races, and events so it’s no surprise they have so many games spread across a diverse collection of genres. From the first-person shooter Space Hulk: Deathwing to the large-scale strategy of Total Warhammer. That alone actually makes the Warhammer collections of games a good place to test virtual reality functionality. The move wouldn’t just be one to change up the perspective, but a way to see what VR can add to gaming genres in different ways.